The history of Indian foreign policy and Sino-Indian relations suggests that India will not concede to live under Chinese dominion in a unipolar Asia. John Garver is correct to point out that the success of national revitalization policies by Narendra Modi in India and Abe Shinzo in Japan will do much to determine the degree of multipolarity in 21st century Asia. The decisive variable will not be the trajectories of India and Japan, but the future role of the United States as the region’s (offshore) primary power. Yet, acknowledging the important potential roles to be played by South Korea, Russia, and Southeast Asia, within Asia, we should recognize that the triangular relationship among the region’s three leading states will do most to determine the constellation of power and the nature of regional order. Garver’s wonderful history of the Sino-Indian competition, Protracted Contest: Sino-Indian Rivalry in the Twentieth Century, underlines the structural and ideational tensions inherent to the relationship between Asia’s giant civilization-states. Their contending national narratives of exceptionalism, overlapping spheres of influence in Tibet, Central Asia, and Southeast Asia, and long-running territorial dispute over their shared 2,500-mile border (which produced a war in 1962 and could do so again in this age of Asian territorial contestation) are fault lines that will be difficult to bridge over. Prime Minister Nehru in the 1950s tried Hindi-Chini bhai-bhai (India-China brotherhood) and lived to bitterly regret his naivete as Chinese forces swarmed down from the Tibetan plateau in 1962. This sounds like ancient history, but polling shows that Indians maintain a high perception of threat from China even today. Low-level skirmishing between Chinese and Indian border forces occurs regularly. Unlike in 1962 when the balance of capabilities between them was quite even, China today has a military budget four times larger, which is qualitatively superior by a larger multiple than that on account of China’s advanced technological lead and focused investments in asymmetric and power-projection capabilities. The Chinese economy is also four times larger than India’s—with the result that even lower growth in the 7.5 percent range, given its broader base, produces “a new India” in GDP terms every two years, as former Goldman Sachs executive Jim O’Neill likes to point out. Modi needs to regenerate the kind of rapid economic growth India enjoyed in the 2000s—when it managed to grow consistently in the 8-10 percent per annum range—to prevent China from pulling further ahead, even if India cannot hope to close the gap within the coming few decades. Ultimately, however, India’s demographics—the world’s largest and youngest working-age population, which will endure until at least mid-century—will enable it to catch up, assuming good governance that produces the economic momentum to take advantage of this vast pool of human capital. In the near term, the magnitude of China’s economic and military lead reinforces Garver’s contention that China could become Asia’s dominant power. The question is whether Chinese superiority makes India more likely to bandwagon with it, as Garver suggests New Delhi could, or, alternatively, to balance against it more vigorously. Recent history suggests the latter. As Chinese growth took off in the 1990s and officials in both New Delhi and Beijing railed against America’s “unipolar moment” following the collapse of the Soviet Union, the two tried to improve their relations through a series of leadership visits and diplomatic agreements, but their security competition actually intensified over this period. The result was India’s nuclear weapons test in 1998, which Prime Minister Atal Bihari Vajpayee frankly justified in a private letter to President Clinton as a direct response to a growing Chinese threat. Vajpayee’s administration then did what had been unthinkable during decades of Indian “non-alignment” and often overt hostility to the West during the Cold War (including actively supporting North Vietnam against America during the Vietnam War and forging a military alliance with Moscow to counter the United States in the 1970s). In a revolutionary pivot, the Indian prime minister in 1998 declared the United States and India to be “natural allies” on account of their shared democratic values and common perception of threat and proposed a new geopolitical partnership on this basis. Vajpayee laid the foundations for a US-India strategic entente that took off in the 2000s. For all the focus on the civil-nuclear cooperation agreement, the symbolic centerpiece of the new relationship, Washington and Delhi’s first major undertaking was a 10-year defense agreement inked in June 2005. While the Financial Times’ characterization of the ensuing cooperation as designed to promote the “Americanization of the Indian military” was perhaps overstated, India today exercises more with the US armed forces than with those from any other nation. The United States is India’s leading supplier of military hardware, which is even more significant since India is the world’s largest arms importer. Terrorism is a greater threat to India than to any society outside the Middle East, but regular mountain-combat and blue-water naval joint exercises between India and the United States are not designed to combat such subconventional threats. Nor are the troop transport aircraft, long-range surveillance aircraft, blue-water naval vessels, and other big-ticket items—including a multi-role combat aircraft Washington remains interested in selling to the Indian air force—designed to defend against terrorism or even the Pakistan army. They are designed to deter and defend against a more capable and more significant great power adversary. The same is true of India’s development of long-range missiles capable of hitting Shanghai and Beijing with nuclear payloads, its deployment of a new mountain division along the contested Chinese border, and its deployment of several combat aircraft wings along the northeast border. India’s new government is even raising paramilitary forces by training civilians to report and resist Chinese border incursions in the northeast of the country. There was a period in 2009-2010, as Indian leaders grew disillusioned with President Obama’s foreign policy, when senior officials spoke internally of maintaining “equidistance” between the United States and China, but this policy did not work. China stepped up aggressive patrolling of its contested border with India, more assertively voiced its claims to the state of Arunachal Pradesh (including objecting to the visit of the Indian prime minister to this “Chinese” territory and vetoing an Asian Development Bank project on the grounds that the state is not “Indian”), and issued “stapled visas” to Indian delegations visiting China from the Indian state of Kashmir, aligning Beijing more openly with Islamabad’s claim to the whole of that territory, including the substantial part of it that lies within India proper. This Chinese revisionism vis-a-vis India was mirrored by Beijing’s aggressive behavior towards Japan in the East China Sea and against Vietnam and the Philippines in the South China Sea. 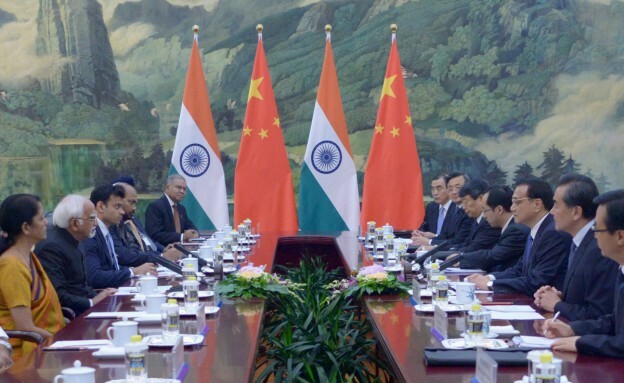 By 2013, an Indian official who had served at a very senior level during the 2009-2010 period of Delhi-Beijing rapprochement was clear: “equidistance is dead, and of course India will tilt towards the United States.” Garver’s expectation of a sophisticated Chinese campaign to woo India away from any balancing coalition gives more credit to China’s diplomatic skill than Beijing has demonstrated in some time. We should be clear: the United States has no interest in an India-China conflict. The last time the two countries fought a war, Nehru’s first call was to President John F. Kennedy requesting US military support. While the United States has a natural alignment of interests with India, that does not include pushing it into a hostile relationship with China. Its own equities vis-a-vis Beijing are enormous and complicated enough already. At the same time, Americans are less worried about the development of any kind of India-China bloc given the disparity of interests and values between these rising powers, which is only magnified by their geographic proximity. In 2014, Modi took office after a campaign in which he cannily challenged Chinese territorial revisionism even as he promised to boost India-China business ties. The same themes featured in the recent visits of the Chinese foreign minister to Delhi and the Indian vice president to Beijing. As the Indian scholar C. Raja Mohan argues, this dualism will be the defining feature of Sino-Indian relations in the period ahead: an intensifying security competition between the two Asian giants combined with deeper economic interdependence between them. This mirrors the quality of China’s relations with other powers, including the United States, Japan, and Southeast Asian nations, which manage ties with China as both a top trading partner and a growing security concern. Why would we expect India to be different? Over the past 10-15 years, China has replaced Pakistan, in the eyes of New Delhi’s strategic community, as the primary long-term threat to Indian security. India has been working assiduously to pursue internal balancing against China, including through substantial (if nonetheless inadequate and inefficient) investments in military modernization. But the correlation of forces means that India will never be able to balance China by itself. For this it needs to complement internal with external balancing through selective foreign alignments, starting with the United States. The confusion of observers stems from Indian officials’ oft-expressed claims that India will “never” join an “alliance” with the United States. They said the same thing about the Soviet Union before entering into just such a tacit alliance in 1972. The United States does not need a formal military alliance with India. American interests call for a strong, vibrant, dynamic India that punches its full weight in Asia and beyond, is an engine of global economic growth, offers an example to other emerging powers of development under democratic institutions, and serves as an independent anchor of an Asian balance of power that is not too heavily tilted in the direction of Beijing. Luckily this is the same vision of India’s role that its leaders and people broadly share. They do not want to be subsumed in a new sinosphere; they want India to sit at the high table of global politics as a primary, not a secondary, power; they covet good relations with the world’s premier powers, most of which still reside in the West; and they want to live in a dynamic, thriving economy. If Modi can help deliver on this vision, and if the United States maintains a forward policy in the region to continue to shape a balance of power that is pluralistic, China will have a much harder time achieving regional dominion. This will benefit not only the region but China itself, which would profit more from continued economic modernization at home than from armed adventures abroad. Let me agree with Dan Twining on the importance of East and Southeast Asia for the new Indian Prime Minister Narendra Modi. Modi has visited East Asia more than he has the West. His primary international mentor is the ex-Singaporean prime minister, Goh Chok Tong. And he turned to this part of the world for legitimacy when the West sought to isolate him. Finally, Modi has cited East Asia as the model for his own pro-growth strategies in Gujarat. Having put economic resurrection at the top of his prime ministerial agenda, Modi sees the East as being as, if not more, important to India than the West. The large pools of surplus capital of China and Japan, their willingness to invest long term in infrastructure and attach less strings and conditions makes the Asia-Pacific an attractive and potentially preeminent economic partner. East and Southeast Asia policy are also much more crucial to Modi’s foreign policy focus on the smaller Indian neighbors: Nepal, Sri Lanka, Bangladesh, and Myanmar. I would also agree Japan is the “game changer” in India’s Look East policy today. The two countries have been edging closer to each other now for over a half-decade. The present friction between Tokyo and Beijing has helped accelerate this drift, but it is not the only driver. Japan began engaging with India strategically following the India-United States nuclear deal. Japanese firms were also impressed with the nascent, high precision engineering hubs that have appeared in India. Tokyo’s territorial disputes with China and uncertainties about US policy led it to reach out to other Asia-Pacific states, including India. Tokyo’s plans for India would push the latter into a different economic quantum level. For example, the four mammoth industrial corridors it has proposed would effectively provide India the foundation for the competitive manufacturing sector it presently lacks. The last Indian prime minister, Manmohan Singh, would apply the adjective “transformational” to relationships with only two foreign countries: the United States and Japan. Some supposed sources of friction are exaggerated or non-existent: these include the “the string of pearls,” Brahmaputra waters, Africa’s resources, and even the border dispute, in which no one has died from enemy fire since 1986. Trade has boomed. Investment will as well, as Modi intends to make India more receptive to Chinese capital. There are 43 bilateral dialogues between the two countries at present and the two sides share interests on some global issues. Indian officials say relations with China retain elements of both “cooperation and competition.” Modi understands and accepts this simple premise. He also believes providing China with a larger stake in India’s economy will lead it to avoid the military and diplomatic stand-offs that marred recent relations. Fortuitously, he may have a perfect match in China’s new leader Xi Jinping, who seems to want to sweep three years of tension under a new red carpet that stresses economic relations and negotiations for outstanding disputes. There seems to be evidence that this is partly driven by his own promises to China’s state-owned enterprises to give them new overseas markets. Twining seems to assume India has already accepted that it will be a de facto part of any US-led Asian alliance structure. I would argue that it is difficult to describe Asian balance of power maneuvering in such black and white terms. India is playing a hedging game, as are many regional powers in Asia and elsewhere. It is shaking hands with China, but keeping its powder dry. It is trying to do a tango with Japan, but is wary of whether Japan’s commitment would wane if Abe were to leave office. It is frustrated with the Barack Obama administration and its protean foreign policy thinking. New Delhi would probably lean towards a Western-oriented alliance, but Washington’s new-found wobbling tendencies have meant India has preferred to spread its risks. John Garver points out that India’s policies in East Asia may be mutually contradictory: running with Chinese hares and hunting with Japanese hounds, seeking to strategically align with anti-Chinese powers and also stabilize ties with Beijing. He also says Beijing may retaliate at some point. New Delhi believes it earns more leeway with Beijing when countries like the United States and Japan—which it accepts as its peers—come wooing. India has played an American card against China in the past and found it effective in getting Beijing to holster its guns. This also seems to be true of India’s burgeoning ties with Japan. New Delhi believes it is relatively low on Beijing’s very hierarchical view of the world and is taken much more seriously when it combines with a country from a higher rung on the ladder. My own interaction with Chinese officials and journalists has led me to believe Beijing is acutely conscious that Sinophobia has increased dramatically in India—and, for whatever reason, this is not something it wants to encourage. Chinese diplomats were very pleased that Modi had not made their country “an issue in the election campaign.” The anodyne Chinese response to Abe’s Republic Day visit to India in January, a visit in which he took the salute of the Indian armed forces, seems to support this argument. Indian diplomats like to say China now fears the Indian media—and its demonization of Beijing—more than it does the Indian military. But all the above give India more geopolitical space regarding China than it is, perhaps, realized.